Presenting scientific evaluations to inform regulatory decision-making to best protect drinking water resources. While the Study provides some data in support of the first two parts of an HHRA, the other parts could not be performed because many necessary data points are specific to site, timing, and affected populations. These specific characteristics present too many unknowns for a general or nationwide assessment to be performed. The Study defines the term “drinking water resources” more broadly than is common in regulation and research. As used here, it considers any water that currently serves or in the future could serve as a source of drinking water for public or private use. This definition includes both surface water and groundwater. According to the Study, between 2000 and 2014 approximately 300,000 wells were hydraulically fractured and approximately 20,000 new wells were drilled and hydraulically fractured in 2015. Between 2000 and 2013, approximately 3,900 public water serving systems supplying approximately 8.6 million people year-round were estimated to have had at least one hydraulically fractured well within one mile of their water source (not necessarily within one mile of the treatment or distribution facilities). Figure 3-5 from the Study provides an overall summary of the activities that take place during a typical oil or gas well life cycle. Note that the actual hydraulic fracturing can take between a day and a few weeks, while production of oil or gas from the well can last for decades. Figure ES 3-5. General timeline and summary of activities. Text Box ES-2 from the Study’s Executive Summary provides a good overview of how a production well is constructed. 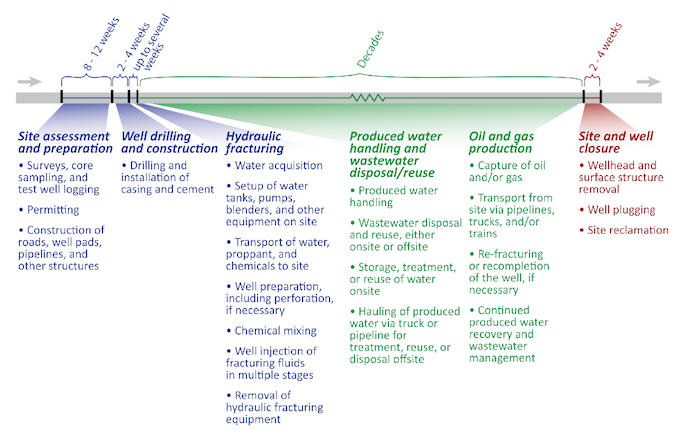 Note that the Study only evaluated the water-cycle impacts during hydraulic fracturing operations, produced water handling, and wastewater disposal/reuse operations (i.e., the last item in blue and the two items in green on Figure 3-5). There are water cycle impacts during the other portions of the well lifecycle, however these impacts were not evaluated. The Study documents the EPA’s review of the potential impacts of water withdrawals for hydraulic fracturing on drinking water resource quantity and quality. The primary data source was reports made to FracFocus. FracFocus is a website, managed by the Ground Water Protection Council (GWPC) and Interstate Oil and Gas Compact Commission (IOGCC), to provide a national registry for chemicals used in hydraulic fracturing. It was originally based on the voluntary submission of data from well operators; however, some states (including Pennsylvania) now require disclosure to FracFocus. Between 1 January 2011 and 28 February 2013 there were approximately 38,000 disclosures to FracFocus. These disclosures formed the basis for the data set evaluated by the EPA. It should be noted that the EPA used data from FracFocus 1.0. The website is in the process of upgrading to FracFocus 3.0. In Pennsylvania, the FracFocus database showed 2,445 disclosures. Pennsylvania had the third largest number of disclosures after Texas (16,882 disclosures) and Colorado (4,898 disclosures). The median volume of water used per well in Pennsylvania was 4.2 million gallons, and the smallest volumes (those in the 10th percentile) were 2.3 million gallons per well. Both Texas and Colorado used less water per well on average than Pennsylvania. Texas operations reportedly used a median volume of 1.4 million gallons per well; Colorado operations used a median volume of 463,462 gallons. Specific reasons for these variations were not identified in the Study; however, deeper wells and wells in “tight” geologic formations (including shales) tended to require more water than shallower wells and those in looser formations (such as coalbeds). In most counties, the nationwide average annual water volumes reported in the FracFocus data were less than 1% of total water use. However, in the Pennsylvania counties examined by the Study, water used for hydraulic fracturing represented a significant percentage of water use. The data in the table below is drawn from Table 4-3 of the Study. Note that due to different sources and the availability of data, the years of use do not align. The Study uses the Susquehanna River Basin as an example to highlight regional differences in water budgets shown on Figure ES-4. As the figure shows, in the Susquehanna River Basin an average of between 4.1 and 4.6 million gallons of water are injected into the well during hydraulic fracturing operations. Approximately 79% of this volume comes from surface waters, approximately 7% from groundwater, and approximately 14% from produced water from other gas wells. Volumes of reused water are included in both columns of the preceding table. Based on the results of the Study, the volumes of water required for hydraulic fracturing can be considerable, so proper management of source water is essential. The Study includes recommendations for specific regulatory approaches that include: encouraging use of alternative water sources (e.g., reuse of oil and gas wastewater as hydraulic fracturing fluid), timing of water withdrawals to avoid low water availability for other uses, and restricting withdrawals in areas with limited or declining groundwater resources. Chemical Mixing Generally, hydraulic fracturing fluid is produced onsite by mixing water with proppants and additives. Proppants (most often sand) are generally the second largest components of hydraulic fracturing fluid. They serve to hold open the fractures induced by the process to promote movement of oil and gas to the production well. Additives are used to adjust the characteristics of the hydraulic fracturing fluid. Frequently, additives are used to adjust the pH of the fluid, change the fluid viscosity, or limit bacterial growth in the well. Although additives are the smallest proportion of hydraulic fracturing fluid constituents, they have the greatest potential to impact the quality of drinking water resources. Proppants and additives are typically delivered to the well site in closed containers that range in volume between 200 and 375 gallons each. Generally, hydraulic fracturing fluid is mixed on an as-needed basis. The water, proppant and additives are drawn from the storage tanks, blended, and then pumped down the well at high pressure. Text Box ES-7 from the Study provides an image of a typical layout for mixing equipment at a well head. As a part of the research for the Study, the EPA reviewed data from FracFocus 1.0 to identify the chemicals used to create hydraulic fracturing fluids. Based on this data set, the EPA identified approximately 1,100 chemicals used in hydraulic fracturing fluids between 2005 and 2013 (see Table H-2 in the Appendices for the complete list) and approximately 600 chemicals in produced water (see Table H-4 in the Appendices for the complete list). There is some overlap between the chemicals in the produced water list with the chemicals used list, but the two lists cannot be directly compared because standard chemical names and confirmed identities (as measured by a valid Chemical Abstract Services Registry Number [CASRN]) could not be confirmed for the entirety of each list. The EPA estimated the frequency of use for approximately 688 chemicals based on the FracFocus 1.0 data. On average, there were between 4 and 28 chemicals used in each well; however, no single chemical was used in all wells. It should also be noted that well operators claimed at least one chemical as confidential at more than 70% of the wells reported to FracFocus. The Study identifies chemicals reported in more than 10% of disclosures to FracFocus 1.0 between January 1, 2011 and February 28, 2013, in Table ES-2, Table 9-2, and Appendix C. Care must be taken when comparing these lists as there are some distinctions in how the data was treated. For example, water, quartz, and sodium chloride were excluded from consideration in Table 9-2 but included in Table ES-2. In addition, Tables C-1 and C-2 distinguish between chemicals used at gas-producing wells and chemicals used at oil-producing wells. This distinction is not made in the other data. The table below presents the additive ingredients most frequently reported to FracFocus 1.0 from wells in Pennsylvania. There were 2,483 disclosures for Pennsylvania wells in the data set, and all but one of the wells were for production of natural gas. The Chemical Abstracts Service (CAS) number can be used to identify and search for data on a chemical without being concerned about synonyms (e.g., “methanol” can also be called “methyl alcohol” or “wood spirits,” but will always have CAS no. 67-56-1). The EPA reported two “median of maximum concentrations by mass” values—one for the concentration of the chemical in the hydraulic fracturing fluid and a second for the concentration of the chemical in the additive prior to mixing. In the table below, we report the median maximum concentration of the chemical in the hydraulic fracturing fluid as this value represents a measure of the quantity of the chemical introduced to the environment. The EPA excluded data from 101 disclosures due to invalid CAS numbers. In addition, the EPA excluded chemicals identified as confidential business information (CBI) by well operators. At least one CBI chemical was identified in approximately 47% of the disclosures from Pennsylvania. We have also excluded water from the table below. Where possible, we have included links to the National Institute for Occupational Safety and Health (NIOSH) International Chemical Safety Cards (ICSC) and to the EPA’s Integrated Risk Information System (IRIS) for each chemical. Chemicals without data in the selected database are marked “Not Available” (N/A). The NIOSH ICSCs provide information about the hazards posed by each chemical and the workplace safety measures appropriate for each hazard type. The IRIS database provides data on the carcinogenic and toxicity effects of chronic exposure to chemicals based on peer-reviewed studies. It should be noted that the dose received, the length of exposure, the frequency of exposure, and other parameters will affect how a given chemical exposure will affect a person’s health. The IRIS database distinguishes between noncancer health effects and increased cancer risk. The data in IRIS can be used to support the first two steps in a Human Health Risk Assessment (HHRA). However, in order to determine the potential effects of the use of a chemical in hydraulic fracturing fluid, additional site-specific information would need to be evaluated. Nationally, different chemicals were used at greater frequency than those in the table above. The large number of chemicals potentially used in hydraulic fracturing processes include some chemicals with known adverse human health effects. However, because of the variability in chemical use, the potential for interactions with local geology, and site-specific factors related to the probability of discharge to the environment, the EPA recommends that health hazard assessments be conducted at local and/or regional scales using the multi-criteria decision analysis approach described in Chapter 9 of the Study. The Study does include a preliminary assessment of potential human health effects of chemicals used in hydraulic fracturing fluids nationally. The toxicology data was required to meet five criteria for inclusion in the report. Data must be from a government or inter-government body. Data source must be peer-reviewed. Data must be based on peer-reviewed data. Data must be focused on protection of the general public. Source must be free of conflicts of interest with respect to chemicals for which it derives values or assessments. 3 were listed as not likely to be human carcinogens. 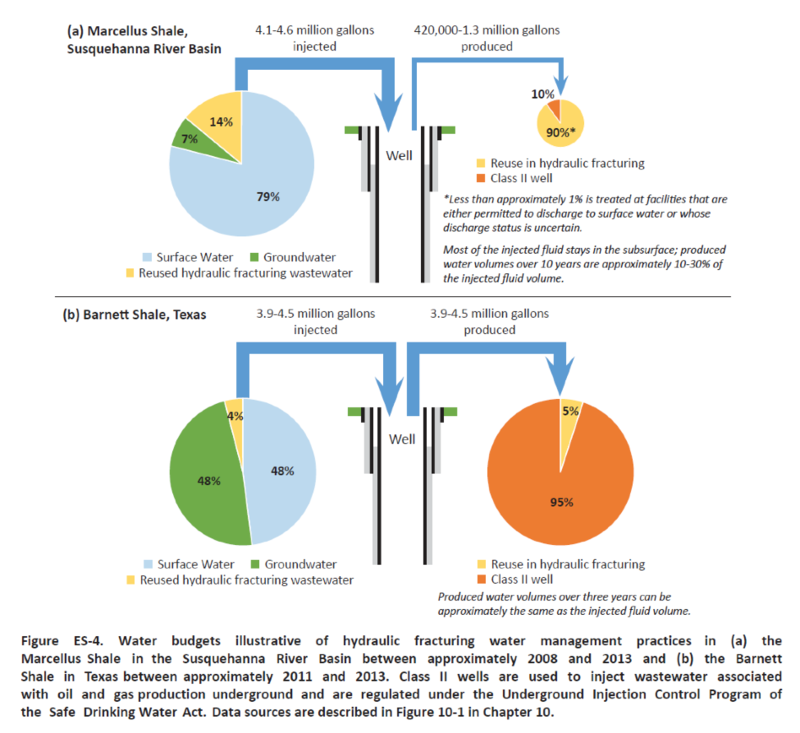 Characteristics of the receiving water resource. Well Injection During well injection, hydraulic fracturing fluids primarily move along two routes: the production wells themselves and the underground fracture networks. However, it is also possible for hydraulic fracturing fluid to move vertically through nearby wells that are either operational or abandoned. 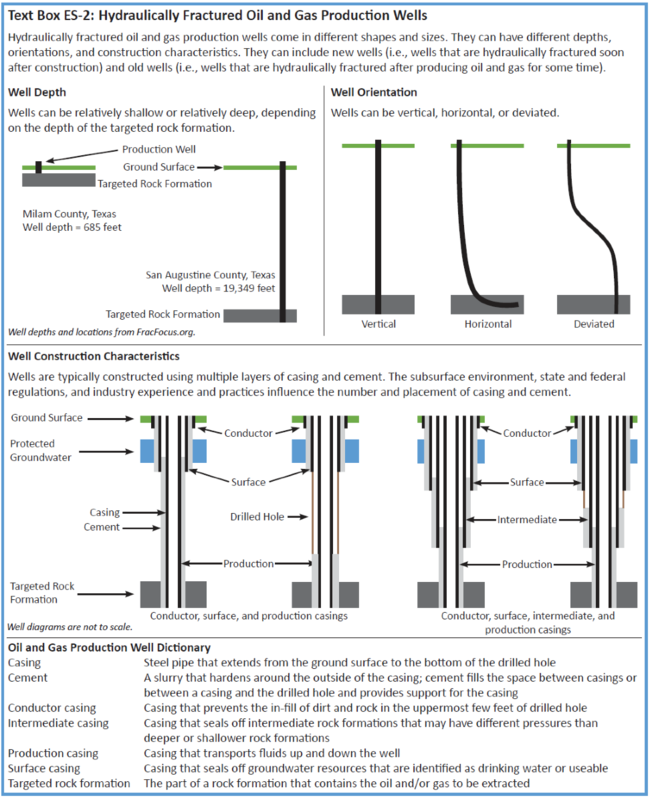 Production wells are designed to move fluids to and from the target rock formation without leaking. This is generally accomplished by installing multiple layers of casing and cement within the boring (see Text Box ES-2). During hydraulic fracturing there are greater pressure and temperature changes within a well and the connecting rock formations than at any other time in a well’s life. These pressure and temperature changes are what cause the fracture network in the rock formation to grow. It is possible for the fracture network to extend into overlying groundwater reservoirs; however, the specific risk depends on the characteristics of the rock formation and the operational approach taken. Fracture growth can be controlled by limiting the rate and volume of hydraulic fracturing fluid injected into the well. In addition, the risk of adverse impact is lower if there is a larger vertical distance between the intended fracture network and the groundwater. There is some evidence to suggest that fractures in shale formations can extend vertically for significant distances, in some cases to more than 1,000 feet. However, detailed fracture mapping is not commonly performed, so it is difficult to assess the overall prevalence of impacts to drinking water resources through this route. The pressure and temperature changes during well injection can cause issues with the mechanical integrity of the wells, particularly for older wells. Some studies of well failures and regulatory actions indicate that between 0.06% and 0.5% of wells experience a failure of mechanical integrity. The data set used by Considine (discussed in the Pennsylvania Environmental Impacts section of this summary) suggests a slightly higher rate of 2.5% based on the number of blowout and venting incidents, and the number of cement and casing incidents. A third potential pathway for vertical movement of hydraulic fracturing fluid is through nearby wells. There have been cases where hydraulic fracturing at one well affected another well more than 8,000 feet away. Generally, however, the Study found that impacts on nearby wells are more likely if the horizontal distance between wells at the surface is within 1,100 feet. Immediately after fracturing, most of the fluid that returns to the surface is hydraulic fracturing fluid (frequently called “flowback”). Over time, however, more of the fluid that comes to the surface is natural groundwater and contains oil or gas. The Study defines “produced water” as both initial flowback and subsequent fluid that comes to the surface. Marcellus Shale wells typically produce 10-30% of the water injected in the first 10 years after hydraulic fracturing (e.g., for 4.1 million gallons injected into a well, between 420,000 and 1.3 million gallons of fluid will likely be produced by that well over the next 10 years). The volume of produced water per day generally declines over time. Produced water flows from the well to onsite tanks or pits through pipes. The produced water is then transported offsite for disposal or reuse, usually by truck or pipeline. Spills of produced water can occur during collection, storage, or transportation for disposal or reuse. The median spill volumes documented by the Final Assessment range between 340 gallons and 1,000 gallons; however, in North Dakota there were 12 spills greater than 21,000 gallons in 2015. As with spills during chemical mixing, the environmental impacts of spills of produced water will depend on incident-specific circumstances. The severity of impacts can be reduced through the implementation of spill prevention and response activities. According to the Study, produced water is generally either injected into a Class II well, reused in other hydraulic fracturing operations, or otherwise disposed of above ground (e.g., at a publicly owned treatment works). A Class II well is a well intended for the injection of fluids related to oil and gas production. These wells are regulated under the Safe Drinking Water Act (SDWA) or state regulations. SDWA Section 1422 sets requirements for the construction, operation, monitoring and testing, reporting, and closure of wells. SDWA Section 1425 imposes minimum requirements for state regulations covering permitting, inspections, monitoring, recordkeeping, and reporting for Class II wells. Class II well disposal is the most frequent disposal method for produced water nationwide, especially in Texas, Kansas, Oklahoma, Louisiana, and Illinois. Although there are approximately 180,000 Class II wells in operation in the United States, very few of them are in Pennsylvania. It is believed that this drove an increase in the volume of wastewater reused in Pennsylvania between 2008 and 2014, e.g., in the Susquehanna River Basin, where an estimated 90% of produced water was reused in other hydraulic fracturing operations. Aboveground disposal generally results in wastewaters being discharged to land or surface waters, usually after treatment. In Pennsylvania, wastewater treatment facilities were unable to adequately remove high total dissolved solids (TDS) from Marcellus Shale wells, and discharges were identified as the source of issues in the Monongahela River Basin. In response, the Pennsylvania Department of Environmental Protection (PADEP) revised regulations to limit impacts on groundwater and surface water resources from aboveground disposal of hydraulic fracturing wastewater. Of the 2,988 violations issued, approximately 60% involved administrative violations only. The remaining NOVs were issued as a result of 845 events that adversely impacted the environment. The researchers categorized the events for major or minor impacts and tallied the totals. The researchers documented 25 events during the period examined that were considered to have had major impacts, representing less than 1% of wells drilled during the period. Minor impacts were significantly more common, reaching more than half of all wells drilled in 2008. However, the number of wells experiencing a minor impact declined during the period examined. Based on this data, the researchers concluded that the number of environmental events that caused physical impact on the environment declined in conjunction with action by state regulators. The fact that regulatory changes drove a reduction in the number of environmental impacts suggested to the researchers that the way in which activities at the surface are conducted is the greatest ongoing risk, rather than the drilling or well development process itself. The researchers concluded that the PADEP has been able to effectively manage the risks associated with unconventional gas development. Disposal or storage of wastewater in unlined pits occurs. Consistency of data available across regions. Preventing disposal or storage of wastewater in unlined pits. The Study also notes that hydraulic fracturing practices and operations continue to evolve; therefore, evaluation of the potential adverse impacts will need to continue. Click here to download a PDF version of this document.